This site design post is even more fractured than usual, owing to continued sleep deprivation. As such, you shouldn't read it, other than to read the tweets from other people. hanezawakirika: Well, your blog looks good anyway. :< RT @Rubenerd: I have CSS skills? This is news to me! This is quite possibly the first time anyone has complimented my CSS skills on Twitter, perhaps ever! Assuming you're not reading this through RSS and are seeing this post on the original site, you can probably see why! Alas, as owning an easel and some tubes of paint don't make you an artist, my perhaps above-average knowledge of CSS doesn't make me a designer. Still, given my ridiculous workload over the last few days and my ensuing lack of sleep, I appreciated the ego stroking XD. Now we just need a certain person to start blogging again themselves. Imajustsaying. For those who either don't remember or have the attention span of an Antarctic Newt (wait, are there newts in Antarctica? What about Gingriches? 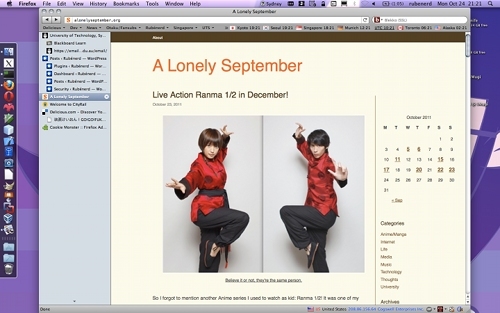 ), last week I blogged about A Lonely September, the blog site of our close friend Sebastian from the UTS Anime club. I lamented the fact fewer people seem to be blogging now, and celebrated the fact he was bucking the trend. Like the proud Antarctic Newt. Despite this glowing endorsement however, Seb was quick to mess with our minds. 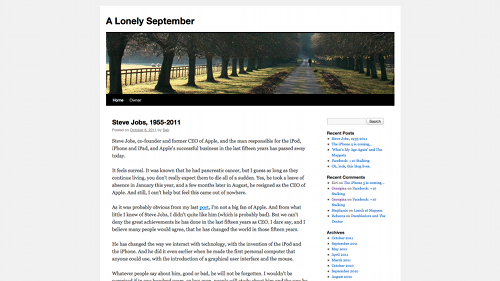 No sooner had I blogged about his blog (yo dawg, I heard you like…) than he changed his site theme. He timed it eerily well, leading me to believe he has hidden cameras installed in my place of residence, or has access to my MySQL tables and was able to see my draft posts. Is it weird to admit I'd be more terrified of the latter? But I digress. To further mess with our minds, Seb claims to have changed his blog theme again. We'll be following this story as it develops.